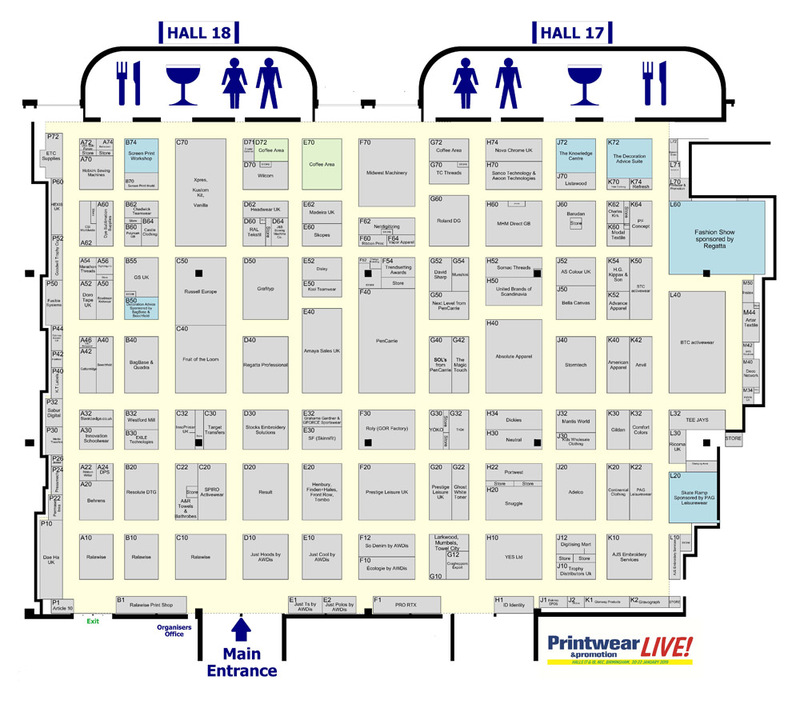 Build-Up & Breakdown Timetable - Printwear & Promotion LIVE! : Printwear & Promotion LIVE! On-Site Contacts: To contact any of the Printwear & Promotion team during the event please report to the Organisers Office, adjacent to the entrance to Hall 18. For exhibitors who have booked space only stands your contractors will be permitted to enter the hall from 8.00am. All aisles to be cleared of building materials and packing cases by 3.00pm on Saturday 19th, to allow aisle carpet to be laid. All displays must be finished, with packing cases removed by 10.00pm on Saturday 19th, to enable cleaners to finish their work prior to the opening of the event. For earlier access for stand builds please contact Nicola Minish, Event Executive. STANDS ON SPACE ONLY SITES: Any exhibitor constructing a stand on a space only position must submit stand plans, including all dimensions, materials, ground and elevation drawings to the Health & Safety Consultant at least 4 weeks prior to the exhibition opening. All space only stands will then be inspected on site by a structural engineer and the cost of this service will be £85 +vat. Where stands are constructed to a height in excess of 4 metres, structural plans proving stand integrity must be supplied as well as stand plans. The cost for inspection and sign-off by a structural engineer will be £385 +vat. This will be invoiced in December 2018. Where stands are constructed to be more than one storey, structural plans proving stand integrity must be supplied as well as stand plans. The cost for inspection and sign-off by a structural engineer will be £550 +vat. These invoices will be raised in December 2018. The exhibitor can appoint their own approved structural engineer if preferred. PERIMETER WALLS ON SPACE ONLY STANDS: Stands with walls being constructed to occupy more than 60% of any side of its perimeter are not permitted without the prior agreement of the organiser. For exhibitors who have booked shell scheme stands, our stand contractor will endeavour to have all the shell scheme built and available for dressing by 6.00pm. Please note it may be possible to have shell scheme stands ready earlier than 6.00pm. Therefore if you require earlier access to your shell scheme stand please contact Nicola Minish, Event Executive (nminish@datateam.co.uk), who will endeavour to arrange this on your behalf with our shell scheme contractor. Entrance to the hall will be permitted from 8.00am. All aisles to be cleared of building materials and packing cases by 3.00pm on Saturday 19th, to allow aisle carpet to be laid. All displays must be finished by 10.00pm to enable cleaners to finish their work prior to the opening of the event. While Datateam Business Media Limited takes every precaution to protect your property during the event, we cannot be held responsible for any loss or damage, and recommend that you remove any valuable items from your stand when it is unattended and ensure that you have suitable insurance cover in place. Breakdown will commence at 4.00pm on the Tuesday, or as soon as all visitors have safely left the hall. The NEC traffic division will release cars from the lorry park onto the VE doors at 4pm, followed by vans and trucks at 4.30pm. Fork lift trucks will operate in Halls 17 & 18 from 4.30pm. Entrance to the hall is permitted from 8.00am. Breakdown must be complete by 2.00pm on Wednesday 23rd. Exhibitors must remove all graphics or display material attached to shell scheme walls. It will be assumed that any graphics or display materials which remain are not wanted and will be disposed of. Disposals of excessive waste material such as brochures, leaflets and items of stand dressing may be charged.